This could be you! 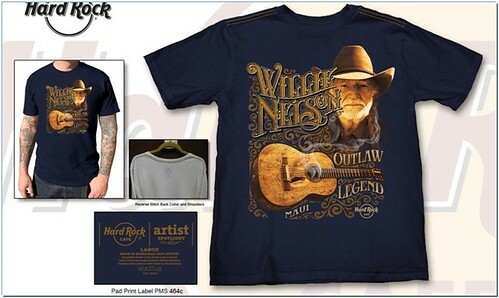 It’s not you, it’s Joe Nick Patoski, but Willie Nelson is offering a chance to meet him on his bus! 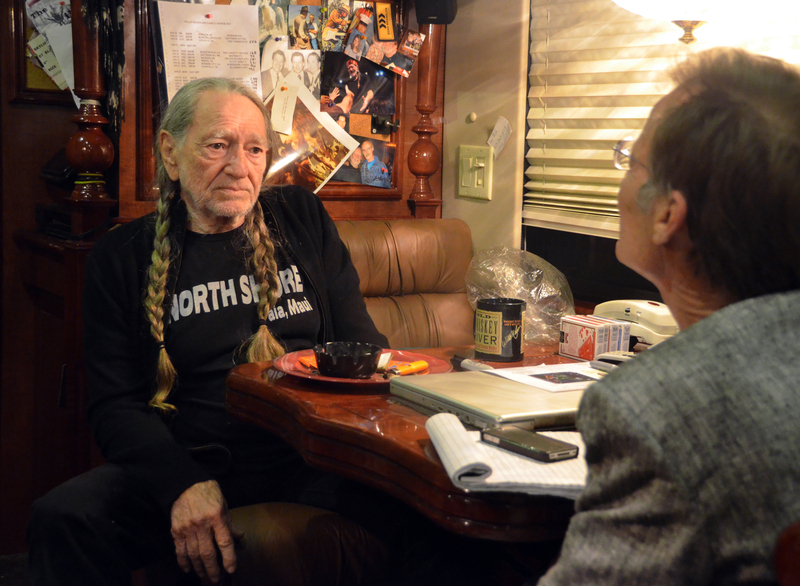 Meet with Willie Nelson on His Tour Bus at the Farm Aid 30th Anniversary Concert in Chicago on September 19, 2015. Includes a Private Backstage Tour, and 2 VIP tickets to the show. 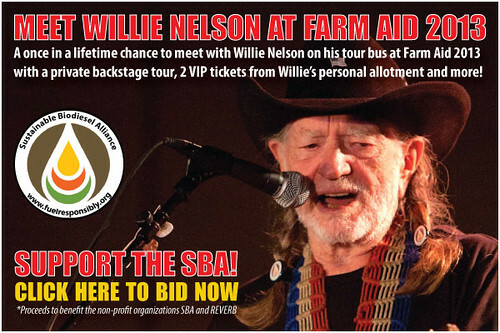 Meet with Willie Nelson on His Tour Bus at the Farm Aid 30th Anniversary Concert with a Private Backstage Tour, 2 VIP tickets from Willie’s Personal Allotment and More! Grab a friend and head to the 30th Anniversary of Farm Aid on September 19th to join the ranks of rock royalty to meet with Willie Nelson on his legendary tour bus. Access to his home on the road is usually reserved for Willie’s family, friends and the occasional superstar or luminary. This is a once in a lifetime opportunity to get personal access to an American legend and get a behind the scenes glimpse into his world. Willie Nelson will step onto the stage tonight at the Brown County Fair as an undisputed legend of American music who has released more than 200 albums, 15 of which have topped the charts. He’s a seven-time Grammy winner and a member of the Country Music Hall of Fame. He’s sold more than 40 million albums in his home country alone. He’s recorded with Bob Dylan, Merle Haggard, Paul Simon, Sinead O’Connor, Johnny Cash, Ray Price, Waylon Jennings, Wynton Marsalis, Norah Jones, Snoop Dogg, Sheryl Crow and countless others. He’s sold Bibles, spent a stretch in the Air Force and been in trouble with the law for failure to pay taxes and lay off marijuana. He’s a fifth-degree black belt in the martial art of GongKwon Yusu and sometimes lives in a green community in Hawaii in a home that gets its energy from solar panels. 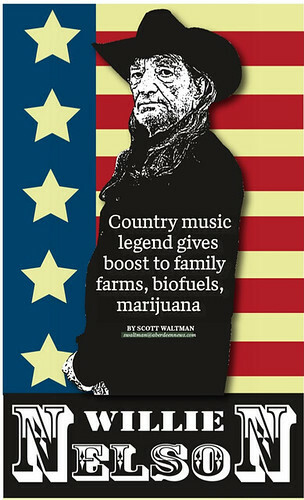 And he’s a vocal advocate of rural America, family farms and biofuels, issues that bind him to the residents of the corn-covered Dakota prairies almost as much as his iconic music. Chuck Beck, director of communications for the Sioux Falls-based American Collation for Ethanol, said it’s nice for the biofuel and ethanol industry to have a proponent as popular as Nelson. “It’s very helpful when you have advocates like Willie Nelson who have a broad stage and are well-known throughout the world and can talk about their (support) of biofuels,” Beck said. The ethanol industry would like to expand in southern markets, in places such as Texas, Alabama and Louisiana, where country music is king. Nelson’s chatter about biofuels could be a boon to that endeavor, Beck said. In 2012, under an agreement between Nelson and Pacific Biodiesel, a biofuel called BioWillie was made available at a retail pump in Maui, Hawaii. A previous Nelson-themed biofuel endeavor wasn’t particularly successful, but it didn’t cool Nelson’s support. “Not only can it help the U.S. economy, our unwanted dependence on foreign oil and the gasping environment, it could also help the family farmers out of this tragic dilemma they have found themselves in through no fault of their own,” he wrote. “We hope his endorsement doesn’t go up in smoke,” Beck quipped. Ah, yes. Consider that an acknowledgement of Nelson’s vocal support of the legalization of marijuana — a cash crop, of sorts. While South Dakota will likely be one of the last states to ease marijuana laws, 21 states and the District of Columbia have, as of April 22, legalized pot in some way, mostly for medical use, according to the websitegoverning.com. It reports that Colorado and Washington have legalized marijuana for both medical and recreational use. Not a big drinker nowadays, Nelson doesn’t hide the fact that he regularly smokes marijuana. “Cigarettes killed my mother, my dad, half my family, so don’t tell me about health when you’re talking about legalizing marijuana, because it’s not dangerous health-wise. I’m the canary in the mine, and I’m still healthy. Had I stayed with alcohol, I would have been dead or in prison somewhere today,” he said in a 2012 story published in The Guardian. Nelson is also commonly quoted talking about the health benefits of medical marijuana and how legalizing pot could be a revenue stream for the government. 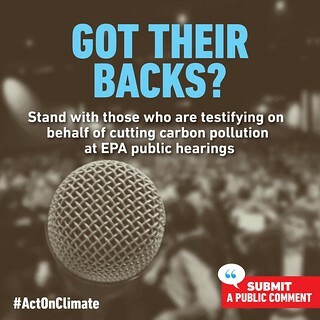 That might not be the type of talk that will garner tons of favor with South Dakota farmers and ranchers. But as a founder of Farm Aid, Nelson’s ag credibility is safe. And it’s not lost on ag-industry organizations. Mike Traxinger, a Claremont-area native, is the corporate attorney for the Aberdeen-based Wheat Growers cooperative. He’s previously worked for South Dakota Farmers Union and the U.S. Department of Agriculture and is a fifth-generation South Dakotan. Given Brown County’s strong history of farming, it’s nice that the fair’s featured performer is an advocate of family farms and rural issues, Traxinger said. His new job has given Traxinger the chance to return to the family farm. Without events like Farm Aid, that’s an opportunity that might not be available to many people, he said. Traxinger said he might go to tonight’s concert. He said his parents, who farm near Houghton, are going. Nelson appeals to multiple generations of music fans, many of whom make their living on the farms that feed the nation, Traxinger said. That’s a point that doesn’t seem lost on Nelson, who also understands the importance of agriculture beyond rural states like South Dakota. 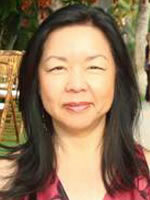 Kelly King and her husband Bob’s pioneering vision created American’s first biodiesel refinery in Maui in 1996. Pacific Biodiesel became the first private company to divert and refine thousands of tons of municipal grease trap waste and waste vegetable oil into clean-burning, premium biodiesel. Annie Nelson , Lukas Nelson, Micah Nelson, Amy Nelson, Paula Nelson, Connie Nelson, Raelynn Nelson, Cathy Guthrie , Martha Jewelle, Dean Hubbard, Matt Hubbard are on Sirius/XM Radio Road Dog Trucking this morning. Annie and Kelly King just spoke about benefits of sustainable biodiesel fuel. 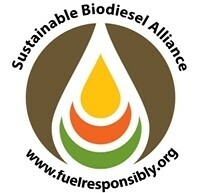 For more information on how you can help the planet by minimizing use of fossil fuels, visit: www.FuelResponsibility.org . Lukas Nelson and Promise of the Real just performed, and Micah Nelson and Insects vs Robots, Paula Nelson Band, Folk Uke, Raelynn Nelson, Martha Jewelle Fowler, Matt Hubbard, Dean Hubbard, et al, are coming up next. Another good reason to subscribe to Sirius/XM Satellite Radio. 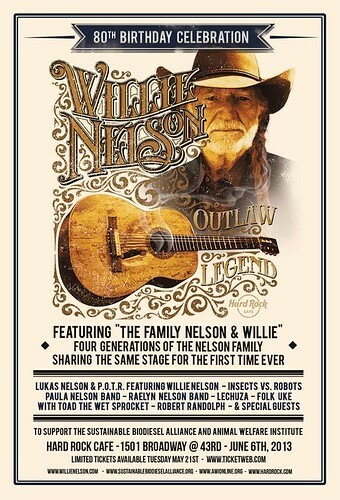 See Four Generations of The Nelson Family sharing the same stage for the first time ever. Performances to include Lukas Nelson & Promise Of The Real – Insects vs Robots- Official Paula Nelson Band – Raelyn Nelson Band – Lechuza – Folk Uke with Toad the Wet Sprocket – Robert Randolph – and Special Guests. 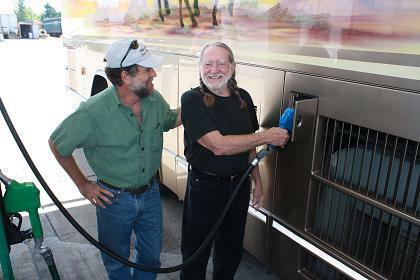 How does Willie Nelson stay green on the road? Q: Willie Nelson is an avid environmentalist. How does he stay green on tour? —Tom M., Mesa, Ariz. 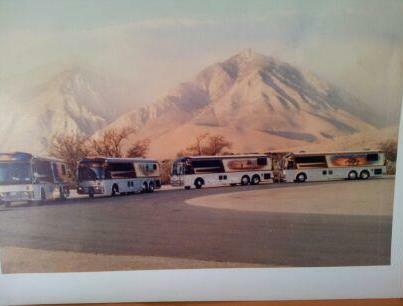 Thank you Budrock, Lighting director for Willie Nelson & Family, for photo. 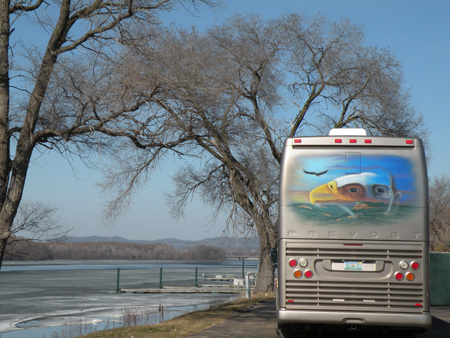 Touring is hardly environmentally friendly, but artists like are working to leave a smaller footprint. 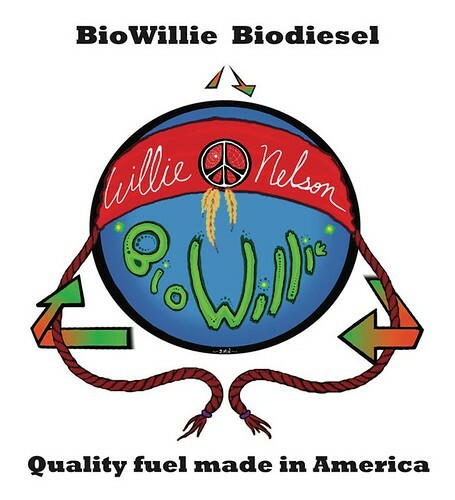 Lots of artists power their tour vehicles with alternative fuels these days, but country legend Willie Nelson took it a step further and founded the Willie Nelson Biodiesel company to produce and sell BioWillie biofuel. In spring 2012, it even launched its first retail pumps. Read about the other four at the webpage.